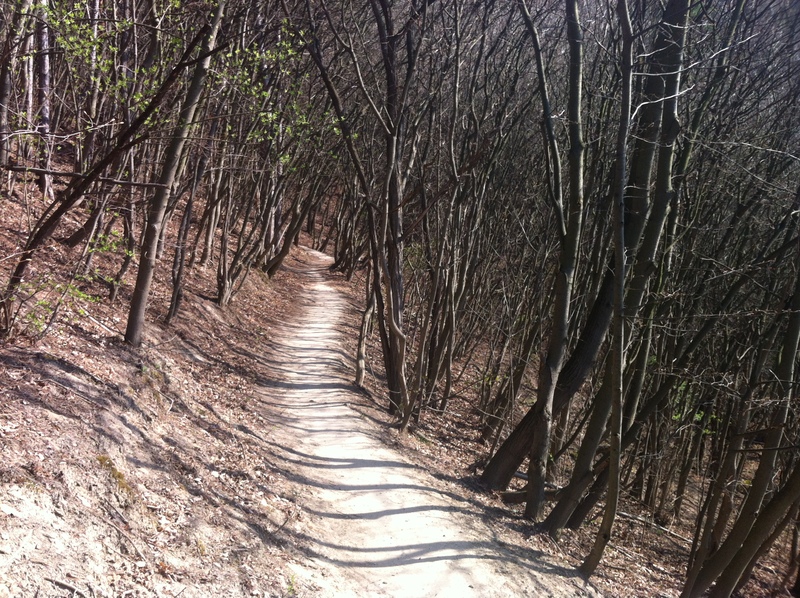 We’ve talked a bit in posts about the countryside around Bratislava: the rearing Carpathian forests of the Mestské Lesy to the north and the wooded trails stretching southeast along the River Danube. But there is also some phenomenal countryside to the west. On a map, of course, Bratislava looks like it’s already so far west within Slovakia that going any further in that direction would mean you’d be in Austria. That’s not quite true. There’s a good ten kilometres of interesting sights sandwiched between the capital and the Austrian border and because this is Slovakia there’s a caveat: most of them are hidden. 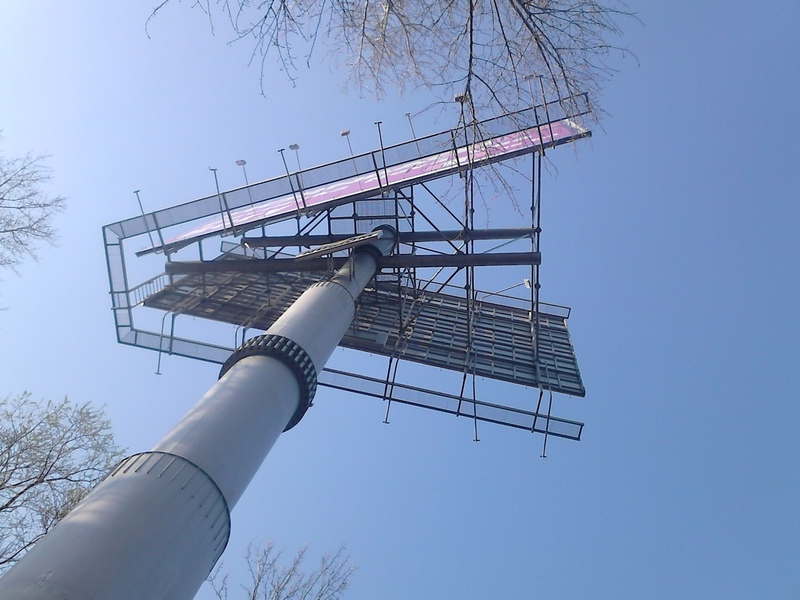 Devínska Nová Ves, in common with several of Bratislava’s suburbs and indeed Communist-built suburbs the world over, may not look picturesque at first glance. But because a lot of these suburbs in Bratislava were built right on the city’s edge, they have a proximity to some stunning natural landscapes. And the high-rise tower blocks and the big Volkswagen Slovakia plant (the country’s largest company, as a matter of interest) bely the fact that Devínska Nová Ves was a pretty village before they arrived on the scene and indeed, in parts, on its steeply-sloping hills, still is. 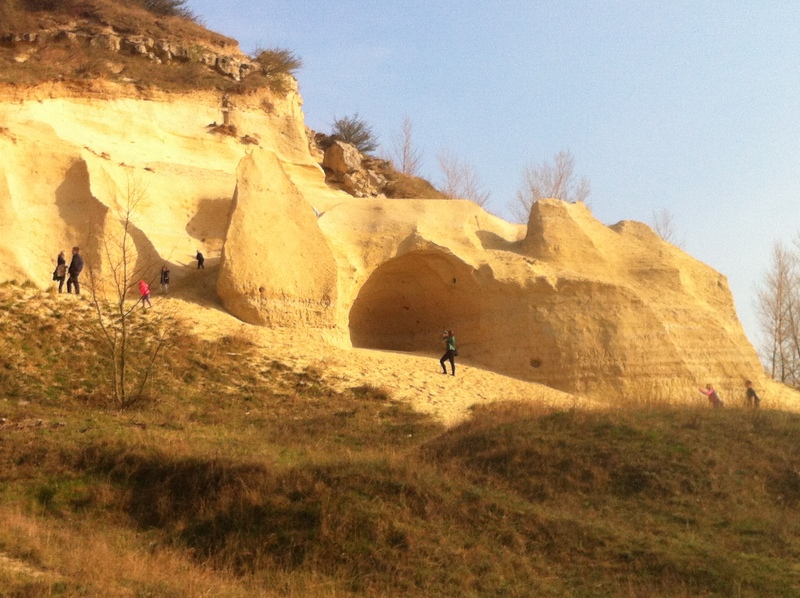 A fascinating insight into Slovakia’s geological past in and around Sandberg. The closest you’ll get to the Sahara in Slovakia (Sandberg). The main entrance from Bratislava brings you under the railway and onto Eisnerova street. Follow this road to the end (through the high-rises) and then bear left on the road that goes alongside the Morava river. On the left, after you pass Rolando restaurant, you’ll find the best place to park in Devínska Nová Ves, right below the Abrázna Jasykňa. This is a cool sight in itself: a former quarry wall which, through the rock that has been exposed, showcases the area’s intriguing geology. 13-14 million years ago, Slovakia was not the coast-less country you see today, but was actually largely submerged under a Tertiary sea, and the resultant strata of rock deposits are strikingly clear here. On the left-hand side higher up on the cliff face is the cave itself, but it’s difficult to get up to go into the mouth. Sandberg – Where Bratislava Meets the Sahara! From the car park, head back up towards the centre to the first road junction (Primoravská), turn right and then take the Slovinec street up from Pension Helios up to the weird and wonderful sight that is Sandberg (pictured above). This is another (far more spectacular) remnant of the Tertiary Sea that once spread out across this part of Central Europe (Záhorie to the north of Bratislava along the western edge of Slovakia is another impressive example). Some 300 kinds of fossils and animal skeletons have been found at Sandberg, including shark’s teeth and whale vertebrae – as well as the distinctly non-marine wooly rhinoceros. Sandberg is the northern end of the massif of Devínska Kobyla, a long forested ridge that forms the westernmost extent of Slovakia’s Carpathian Mountains and runs south from here to the afore-mentioned Devín Castle. It’s a palaeontologist’s dream come true but it’s a dramatic sight too: a series of part-fossilised dunes that rear up out of the side of Devínska Kobyla like some ancient natural fortress. It should be noted at this point that climbing on the sand formations is not encouraged – a fence is supposed to deter entry but people often ignore this and risk endangering what is a precious and extremely fragile environment. Most visitors get the bus or drive to Devín Castle from Bratislava but for a more rewarding way to get there, make the journey out to Sandberg (drive or take bus 28 every 30 minutes from Most SNP to Devínska Nová Ves). From here, a beautiful path cuts along just below the Devínska Kobyla ridge through forests above the Morava River valley as it flows towards its confluence with the Danube. It’s a 50 min to 1 hour brisk walk along and finally down to Devín Cintorín (Devín Cemetery) which marks the edge of Devín town, and 10 minutes’ further walk to the castle. You can return the same way or make the walk into a loop which will bring you back above Sandberg. From Sandberg, the first part of the walk stays in the open, with great views looking south of the Morava, looking ahead to Devín Castle. To the west, you’ll see the outline of Schloshof castle, over the other side of the river on the flat farmland of Austria (see below for more details on Schloshof). Right below you, along the Morava itself, you’ll see Slovakia’s best dedicated cycling trail, which runs from the suburb of Dúbravka (connected by tram number 5 to the city centre) through the edge of Devínska Nová Ves and on to Devín.) Then you’ll pass some old quarries (with a good grassy picnicking area below) and on your right the old remnants of the Iron Curtain’s border defence towers. Whilst the vista today looks peaceful, many people died trying to cross the Morava River from East to West before 1989. This was the Iron Curtain: right here. The route at this point goes through some wonderful tunnels of trees, then rises through woods to reach a wildlife information board and the confluence of the path coming down from the top of the Sandberg ridge. Here is a great view across to Devín Castle. The path comes out into the open again here and descends to the cemetery, but just as it starts to descend, the exciting return route sheers off up to the left. You climb steeply up on a minor path to come out on the bare southernmost edge of the Devínska Kobyla ridge (where the best views possible of Devín Castle await). It was around here we got a bit lost and some whimsical old guy wearing inexplicably just slippers on his feet sung us some old Slovak songs without us really inviting it… Wend your way through the scrub and thinning woods just passed here to come out on a signed red trail which starts to curve back into the woods in the direction of Sandberg, almost on top of the ridge this time. You follow first a cycle path and then a wide, clearly-marked green trail, and finally a yellow trail to take you down onto the ridge right above Sandberg, then around the edge and back to the start point. Just north of where you turn off on Primoravská to get to Sandberg, you’ll find the unlikely tourist information office of Devínska Nová Ves, and the beginnings of the Cyclomost Slobody (Libery Cycleway) – a great cycle path that crosses the Morava into Austria and ushers you forth to the lavish and stately Schlosshof castle, which in terms of the castle’s lavish interiors and serenely beautiful formal gardens looks quite like Austria’s Versailles. This last weekend it was unfortunately closed (the castle is open from March 25th through to the beginning of November) although you can still of course use the cycle bridge at any time: I’ll head back there soon and will have a more detailed post on the castle then. For now, here’s the link to the Schlosshof official website. What with the Sandberg-Devín Castle walk AND a stop-off at Devín Castle it will be extremely difficult to fit Schlosshof castle into the same day’s trip. You could combine the Sandberg walk with Devín Castle or the Sandberg site itself with the cycle out to Schlosshof in a day, however. As mentioned above, drive or (best of the public transport ops) take bus 28 every 30 minutes from Most SNP to Devínska Nová Ves. NEXT ON THE JOURNEY: From Devínska Nová Ves it’s a 25km journey round to the southwest across the border to Hainburg in Austria. Everyone knows about those grand old Central European trains, right? Kicking back in the dining car with a frothy beer and a plate of fried cheese (well fried cheese is unquestionably the dish all Central European trains do best) as you cruise between nations is undeniably one of the continent’s very best experiences. And of course, being a through-stop between west and east, Bratislava’s Hlavná Stanica train station is one of the great the jump-on points for such a journey. For Bratislava train connection info, let’s give the floor to the Man in Seat 61. But Bratislava is blessed with an arguably still grander possibility of approach (or indeed departure): on, oh yes, the Blue Danube itself – from Vienna (or, if you just want to glimpse Bratislava from the water but not stop, Budapest). OK, the Danube (Dunaj) is not always as blue as Strauss insinuates in his music Nevertheless, large swathes of the journey between Vienna and Bratislava are very pretty (through Nationalpark Donau Auen) and the water really does seem cobalt at points when contrasted with the green of the forests on either side. The prettiest part of the journey is around the town of Hainburg near the Austrian border and, just beyond, by the confluence of the Morava at Devín Castle. 1: Lod.sk Vienna-Bratislava Hydrofoil: Hydrofoil boats leave from late April to late October. They run Wednesday to Sunday from late April to late June, daily in July/August and Friday to Sunday from September until the end of the season in late October. Departure from Vienna is 17:30, departure from Bratislava is 9:00 (the boats, Slovak-run, give you the day in Vienna or the night in Bratislava). Journey duration is 90 minutes downriver to Bratislava and 105 minutes upriver to Vienna. Prices are 20/29 Euros single/return. Of course with your ticket you don’t have to travel back next morning; it’s valid for when you want to travel back. The Lod.sk website is now in Slovak (of course), German and English. 2: Twin City Liner Boats: The Austrian-run Twin City Liner runs regular (almost) year-round connections from Vienna to Bratislava. Departure from Vienna is at 8:30, 12:30 and 16:30 with departure from Bratislava at 10:30, 14:30 and 18:30. From March to October there are usually one or two additional services as well each way. Boats are a bit quicker than the Lod.sk Hydrofoil boats as a rule (75 minutes downriver to Bratislava, 90 minutes upriver back again). Prices however seem a tad steep, at an average 30 Euros for a single trip – meaning that overall Englishmaninslovakia recommends Lod.sk when possible during the tourist season. The Twin City Liner website is in German, but has a basic English version. Departure in Vienna: Schiffstation Reichsbrücke, Handelskai 265. All Bratislava boats depart from here, unless you’re on a cruise ship, in which case you’ll likely be told everything and won’t require this blog to help. Nearest subway: Vorgartenstraße (on U1 line). Departure in Bratislava: International port, Fajnorovo nábrežie 2, just down on the river from the Old Town east of Most SNP. Here’s a list of facilities available in the terminal building. Between the beginning of June and the end of August, a Budapest to Vienna Hydrofoil passes through Bratislava but ridiculously does not stop off (it used to; they scrapped it). Departure times are 9:00 from Budapest (Tuesday, Thursday, Saturday) and 9:00 from Vienna (Wednesday, Friday, Sunday). You’ll pass through Bratislava at approximately 13:45/10:30 respectively depending on which way you’re going. Total journey time is between 5.5 and 6.5 hours. GETTING TO BRATISLAVA BUT NOT BY BOAT: See our list of air connections to Slovakia. NEXT ON THE JOURNEY: On the way from Bratislava to Vienna by boat, the most diverting spot, just over the Austrian border, is Hainburg, 16km west.